The Palestinian Health Ministry has reported that a third Palestinian died, on Saturday evening, from serious wounds he suffered last Monday, when Israeli soldiers shot him with live fire in northern Gaza. The Ministry said the Palestinian, Ahmad al-‘Abed Abu Samra, 21, was shot by Israeli soldiers, on Monday May 14, and remained in a critical condition until he succumbed to his wounds, on Saturday evening, at the Shifa Medical Center. The Palestinian, from Jabalia an-Nazla, in northern Gaza, was shot by the soldiers during the Great Return March, near the border fence, east of Jabalia. 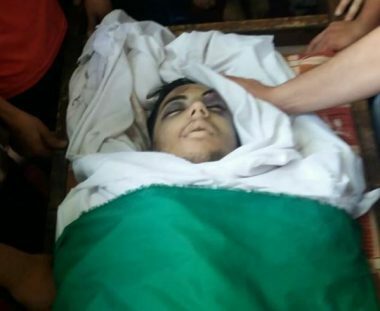 Earlier on Saturday, the Health Ministry in the Gaza Strip has reported that Mohammad Mazen Oleyyan, 20, died from serious wounds he suffered on Monday, May 14. On the same day of his serious injury, Israeli soldiers killed 60 Palestinians, including an eight-month-old baby, six children and four officers of the Ministry of Interior and National Security, in the Gaza Strip, and injured more than 2700, among them 122 children, and 44 women. 27 of the wounded Palestinians suffered very critical wounds, 59 serious injuries, 735 moderate wounds, and 882 suffered light wounds. Their deaths bring the number of Palestinians who were killed since the processions started on Palestinian Land Day, March 30, to 120, while approximately 12000 were injured.